Hit like if you're interested in becoming one of our crack team of product testers! As a little thank you present, you get to keep all the products you review. Sign up to join the team through our Members Club app (scroll down) it then takes you to a short survey to fill out, won't post the link in case its tied to each individual. Then your well on your way to becoming a tester i.e. they pick a few people out of the thousands or tens of thousands who join their club, fill in their survey and, no doubt, open themselves up to lots of spam advertising. Then your well on your way to becoming a tester i.e. they pick a few … Then your well on your way to becoming a tester i.e. they pick a few people out of the thousands or tens of thousands who join their club, fill in their survey and, no doubt, open themselves up to lots of spam advertising. That is for sure, with the application on the Facebook they can even post on your behalf as well as send spam to the email address.Worth a try if you don't mind this. Thank you for taking the time to complete this survey and for showing … Thank you for taking the time to complete this survey and for showing interest in Morphy Richards consumer trials and our products.We can confirm that you have been successful and are now a member of the Morphy Richards House Proud Innovator Consumer Trial Team, we will contact you using the details provided when a suitable product becomes available to trial. Please note you do not need to apply again as we already have your details on file. I got the same - did everyone get this message? you don't have to allow them to post things on behalf, just select do not allow. You can always unsubscribe from spam mail .. and you can always turn off the app on facebook that posts on your behalf .. but I guess some people want everything served on a plate for them... EASE UP LIZZIE! "We're currently processing a large number of applications and have temporarily suspended the app – good luck to all that have applied to date and we'll be back up and running soon." 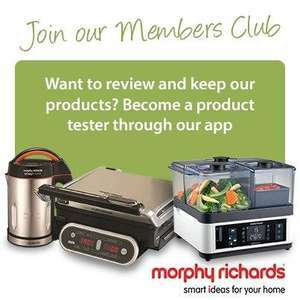 It's quite good being a product tester for Morphy Richards, as I've been one for the last 3 years and have been picked to test 5 different products in that time, all of which I've kept once testing was finished. The surveys can be a bit monotonous though and it feels like you answer the same question over and over!